The New Mexico Big Horn Gun Club (NMBHGC) was founded by several local black powder shooters in 1977. The club is a non-profit organization, and is an NRA affiliated club. Club membership is open to the public, and new members are always welcomed. Our members come from all surrounding communities, including Edgewood, Moriarty, Tijeras, Santa Fe and Albuquerque. » Range may be closed during cleanup. The next Club Meeting will be held on Thursday, April 4, 2019. » General meeting for members starts at 7:00. See brochure for registration and contact information. » Class Shoot on Saturday May 25th from 2 to 4 PM. We are pleased to announce that the club has obtained certification with the Civilian Marksmanship Program. This certification will allow club members to purchase 1911 Handguns from the CMP up until October 4th. For more information on this program, visit the Civilian Marksmanship Program site. You may also view the club’s CMP Certiciation. $5,000 Raised for the Torrance County Sheriff’s Department! 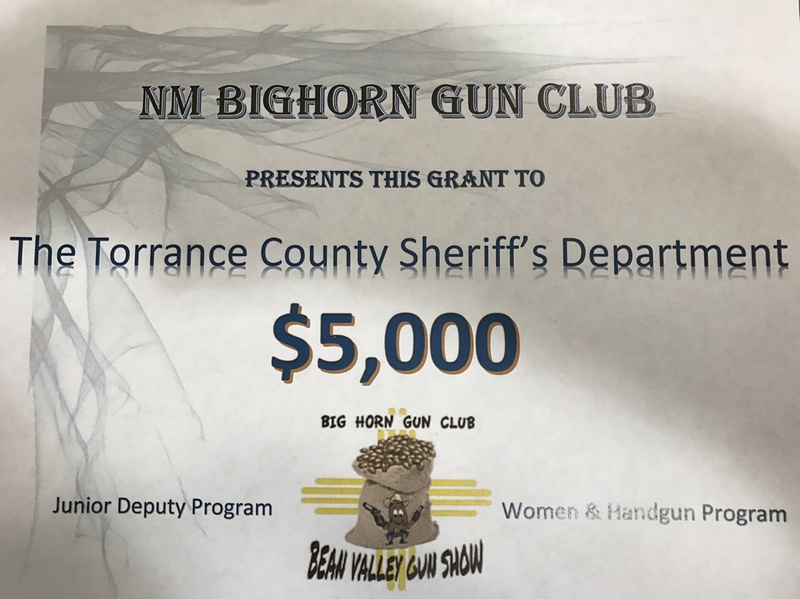 The New Mexico Big Horn Gun Club raised $5,000 at the Bean Valley Gun Show, and has given a grant to the Torrance County Sheriff’s Department. This money will go to support activities such as the Junior Deputy Program and the Women and Handgun’s Program. Thanks to all the volunteers and organizers for making this a success!